This is a sign and sorbent all in one. 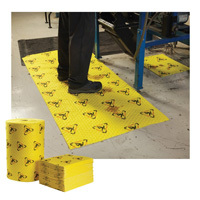 The mat is highly absorbent for all-purpose fluid pick-up and hazardous chemical. It’s hi-vis colour and printed message are great for areas where the risk of slips, trips and falls is great.